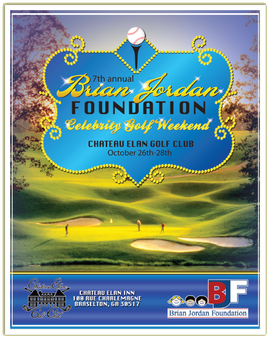 October 26-28, 2013 - The Brian Jordan Foundation is excited to extend an advance welcome to you for our 7th Annual Celebrity Golf Weekend. We are so pleased to once again provide the opportunity to bring together business leaders, celebrities, and volunteers to support the Brian Jordan Foundation. This year, it's our honor to offer two afternoons of golf, a concert, and a wine tasting event all on the beautiful grounds of Chateau Elan's elegant winery and vineyard. BJF will have Live Entertainment at the Draft & Casino Night Party. Little Texas will no longer participate in the Fundraising event. Click Here or on the image below to view our official brochure describing this year's event! Clicking the image will open a new page where you can see the full brochure for the golf tournament. Click Here or on the image below to access our 2013 registration form. 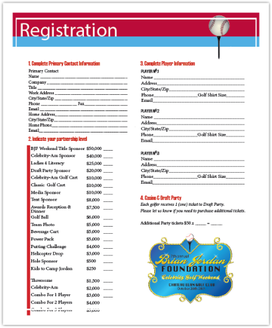 Clicking the image will open a new page where you can see the full registration form for the golf tournament. Do You Have A Quick Question About The Tournament? Ask Here!